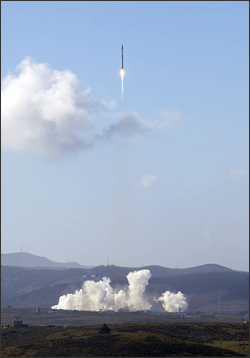 Feb 11, 2014 • [Source: Tom Holm, USGS & Steve Cole, NASA] One year ago, on February 11, 2013, NASA launched the Landsat 8 Earth-observing satellite from Vandenberg Air Force Base near Lompoc, Calif.
A flawless launch, followed by the transfer of operational control on May 30 to the U.S. Geological Survey, marked the start of the satellite’s mission to extend an unparalleled record of observing Earth’s landscape from space. Landsat 8 is the latest in the Landsat series of remote-sensing satellites that have provided a continuous record of change across Earth’s land surfaces since 1972. Landsat provides land images globally at a scale that impartially documents natural processes such as volcanic eruptions, glacial retreat, floods, and forest fires and human-induced processes such as urban expansion, crop irrigation, and forest clear-cutting. The Landsat Program is a sustained effort by the United States to provide direct societal benefits across a wide range of human endeavors including human and environmental health, energy and water management, urban planning, disaster recovery, and agriculture. Over the past 12 months, the USGS EROS Center and the NASA Goddard Space Flight Center in Greenbelt, Md., have worked side-by-side putting the new satellite through its paces — steering it into its orbit, calibrating its detectors, collecting test images, certifying the mission for operations, and collecting much more imagery each day than its predecessors for users throughout the United States and around the world. “NASA’s successful development and launch of Landsat 8, the rapidly increasing volume of image data distributed by the USGS to research and operational users worldwide, and the Administration’s identification of Landsat as one of the Nation’s critical data streams – all of these factors have sparked renewed emphasis by the Administration and the user community in securing uninterrupted access to Landsat data for decades to come,” said USGS EROS Director, Frank Kelly. A year after launch, the record for Landsat 8 is clear. The new satellite strikes an effective balance of introducing new technologies and capabilities while maintaining compatibility with the existing 41 years of Landsat data. With the seamless integration of Landsat 8 into the family, the Landsat program continues to provide objective information about the Earth that is trustworthy, easily accessible, and useful in many different fields of science and resource management.